On the guitar, you can use the CAGED arpeggios to form minor chord arpeggios just as you can with major chord voicings. To do this, you lower all the 3rds in each arpeggio pattern to minor 3rds (f3rds). This simple adjustment changes everything from major to minor. 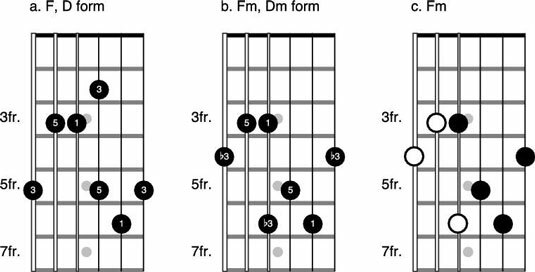 You then fret and play different kinds of minor chord voicings with each of the five minor CAGED forms. Adding the minor CAGED forms to the majors is a lot to pile on your plate, especially if all the major forms haven’t yet sunk in completely. I suggest working through this next section very slowly, possibly even saving the minor forms for another time. Here is the original C form (major). Compare that to the second diagram, B, which shows the Cm form (the m stands for minor). As you can see from the figure, the Cm form uses the same arpeggio pattern as the C form except with minor 3rds. C and D show some sample minor chord voicings. Notice that the actual chord in this position is Dm. In fact, D is part of a basic open Dm chord that’s a commonly used shape all over the neck. Remember to only play the black dots in examples like this. Here is the original A form. The second diagram shows the same arpeggio pattern with minor 3rds — or the Am form. In this position, the actual chords are C and C minor. The third diagram illustrates a commonly used minor chord voicing. Notice that it’s a standard minor barre chord. This barre chord is often reduced to only strings 1 to 3, as shown in the fourth diagram. Here is the original G form, followed by the same arpeggio pattern with minor 3rds (or Gm form) in the second diagram. In this position, the actual chords are A and A minor. The third shows you one way to get a useable barre chord out of it. The fourth shows a unique Dm in Gm form that appears in the song “So Much to Say” by Dave Matthews Band. Here is the original E form, while the second diagram shows the same arpeggio pattern with minor 3rds (or Em form). In this position, the actual chords are G and G minor. The third shows a sample minor chord voicing, which is a standard minor barre chord. This barre chord is often reduced to just strings 1 through 3, as shown in the fourth diagram. Here is the original D form, followed by the same arpeggio pattern with minor 3rds (Dm form), shown in the second diagram. In this position, the actual chords are F and F minor. The third shows a sample minor chord voicing, which is a full Dm shape when played in the open position. Notice that this shape shares a lot in common with the Cm form.